A Type 1 Incident Management Team is gearing up to attack the Howe Ridge fire burning in Glacier National Park, bringing the most experienced fire teams to the lines. An infrared overflight on Wednesday night provided updated mapping of the fire perimeter, which now encompasses about 3,500 acres, according to a press release from Glacier National Park on Thursday morning. There are approximately 78 personnel assigned to the fire. There have been no reported injuries. The fire has destroyed several homes and other buildings. The Southwest Area Type 1 Incident Management Team, under the command of John Pierson, has arrived and will be taking over management of the fire on Friday morning. On Wednesday, a “K-Max” Type 1 helicopter and “Huey” Type 2 helicopter dropped water on the edges of the fire throughout yesterday afternoon and evening in order to slow fire growth. Fixed-wing aircraft were prevented from flying due to low visibility. 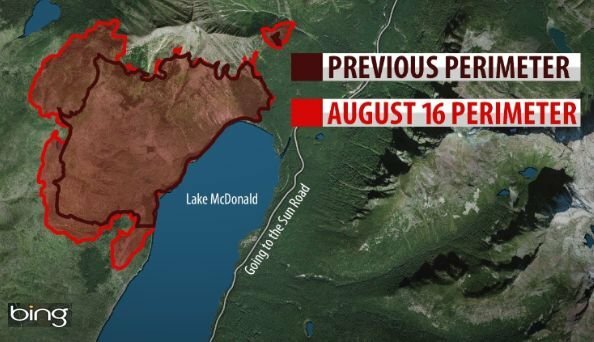 Thursday’s firefighting efforts will include structural protection and ground crews will continue to establish a hose lay at the north end of Lake McDonald. Air support will continue to be used to control fire spread as conditions allow. "It’s going to take some time to figure out what’s going on get the lay of the land, to understand the resources we currently have and resource needs for the future," Fire Information Officer Diane Sine told MTN News. "A Type 1 team generally comes with their own meteorologist, so someone who can actually get out onto the ground, take measurements, put in weather stations, really figure out what’s happening in this specific locale. We will have fire behavior analysts who will be able to analyze what is likely to happen based specifically on our terrain, our weather, our fuel loads." One of the main concerns in fighting the Howe Ridge Fire is the safety of the firefighters: "One of the incredible risks is falling trees and snags. Our fire crews that are working up there are camped on the shore of Lake McDonald — not within the fire," Sine said. "They’re not in a danger area, but a distance from the fire. And they have been awakened constantly the last two nights with the sound of snags coming down throughout the night." Glacier National Park is under Stage II Fire Restrictions. No campfires are allowed and smoking is prohibited except within an enclosed building, vehicle, developed recreation area, or barren area three feet in diameter. The vast majority of the million-plus acre park is unaffected by the fire. The best source for current information on the status of Glacier National Park is the official website (click here), or the Fire Information Hotline that has been established by the Park at 406-888-7077. You can also check Inciweb for fire updates.